This 2" thick mat is made from foam that provides soft cushioning for low impact activities. Great for teaching basic gym exercises with young children! Make the safe, green choice! This mat is made from foam that provides soft cushioning for low impact activities. It provides low shock absorption. Ideal for teaching basic gym exercises with young children. 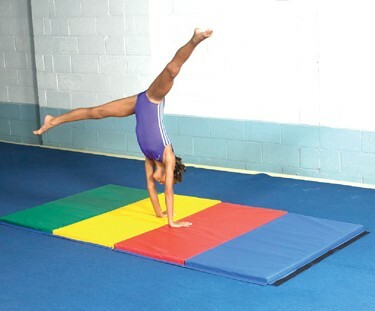 Not just safe for gymnasts, EnviroSafe gymnastics mats are also safe for the environment. Our gym mats are made with polyester fiber that is 100% recyclable, toxin-free, fire-retardant and mold and mildew proof.